Seattle offers mountains, water, views, gardens, wine, seafood… and coffee. I grew up in Seattle and we have an apartment there, near my family. This summer, a number of friends are going to the Northwest on vacation and have asked for advice. Here is my answer to them. There are lots of good boutique hotels, but the grand old lady is the Fairmont Olympic Hotel. This is where breakfast is served in a dining room on white linen and coffee is poured from a silver pot. It is centrally located downtown. The downside? No view. The Four Seasons Hotel is new and luxurious. Get a room with a Bay view. It also has a good downtown location. The Inn at the Market was remodeled in 2015. 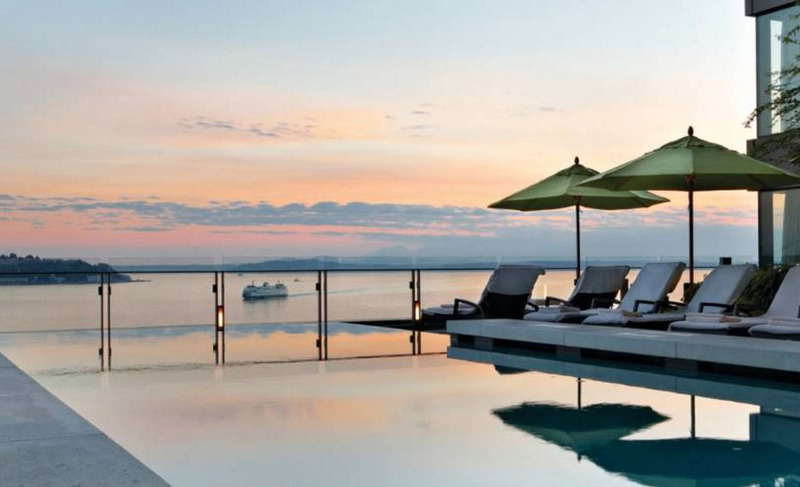 It offers wonderful views of Puget Sound and the Olympic Mountains beyond. This small, luxury hotel with just 76 rooms is a Northwest favorite. 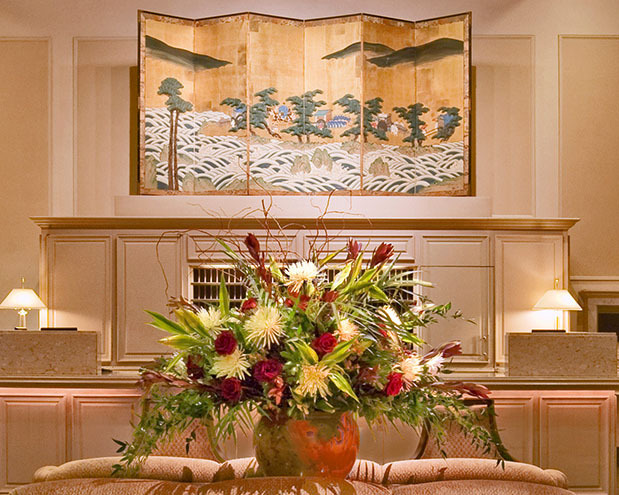 The Mayflower Park Hotel is an elegant, historic, boutique hotel with European elegance. No view, but a great downtown location. Dining is an art form in Seattle with lots of farm (and net) to table options. Fresh seafood is a must when visiting Seattle. One night? 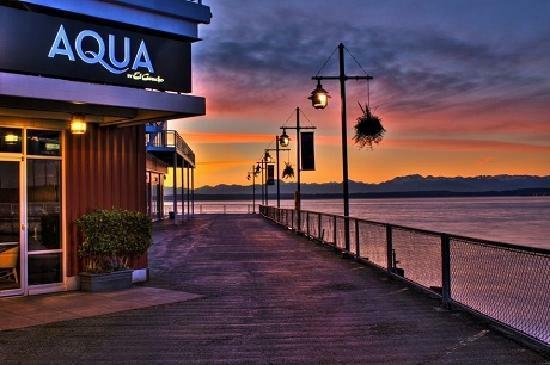 Eat at Aqua by El Gaucho. On the downtown waterfront. Ask for a table with a view or sit outside on the deck in good weather. Great service and seafood. Canlis Restaurant is a Seattle classic. It offers Steak and fish with a little Asian flavor. Ask for a table with a view. At the edge of Lake Union. Ray’s Boathouse Restaurant is out by the Locks on Puget Sound (25 minutes from downtown, through Fremont). Get a table by the water. Enjoy salmon and Dungeness crab. Toulouse Petit brings the ‘Big Easy’ to Seattle with locally sourced ingredients. How to Cook a Wolf offers fresh ingredients. Fresh Italian from pasta and wood-fired pizza are excellent, but there is rib-eye for you carnivores. For a Ballard neighborhood adventures with fresh oysters as the focus, try The Walrus and the Carpenter. About fifteen minutes from your downtown hotel (by overhead monorail or UBER) you can go to the Seattle Center. This was the site of the Seattle World’s Fair in 1962. The Space Needle offers a great view and a good lunch in the rotating restaurant. You can also just take the elevator to the observation deck and get oriented. *2019 Update – Seattle’s Space Needle has under gone a recent transformation. Some of the notable renovations include the world’s first revolving glass floor at the 500′ level, 0pen glass panels on the outer observation deck and 24 Skyrisers (glass benches) for a unique view of the City and beyond. The Atmos Wine bar and Atmos Café are available for light bites. Tickets are $32.50 and can be purchased online. 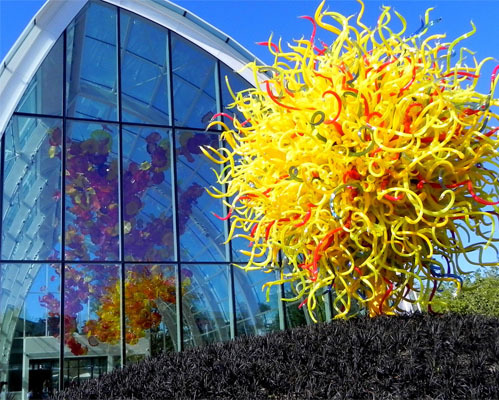 At the base of the Space Needle, there is the Dale Chihuly Garden and Glass Museum. Chihuly is a world famous glass blowing artist who has had installations in Venice…and around the world. It has a garden filled with flowers and glass – worth a look. If you have any members of the 60’s generation with you, check out the MoPop, originally named Experience Music Project (EMP) at the Seattle Center. It is a little too fond of Jimi Hendrix, a local hero, but it is in a wonderful building and has good exhibits. It was built by Paul Allen and designed by Frank Gehry. *2019 Update – While MoPop, Museum of Pop Culture, is still connected with music, it has stretched it’s reach to connect with more people. Near the Seattle Center, you might want to go to The Gates Foundation. This is a good overview of the innovative work in philanthropy lead by Bill and Melinda Gates. A ten-minute car ride away from the Seattle Center, toward Lake Union, there is a new urban center forming. Lake Union is now home to Amazon Headquarters (Amazon Headquarters Tour), the headquarters store of R.E.I. (Learn to rock climb on the R.E.I. pinnacle) and The Center for Wooden Boats (Rent a boat, see an exhibit or take a class). There is good outdoor café dining at the edge of Lake Union. People like the Fremont neighborhood. It is another 15 minutes away, across Lake Union, probably by UBER. It is funky, crafty and typical of the University of Washington community it neighbors. 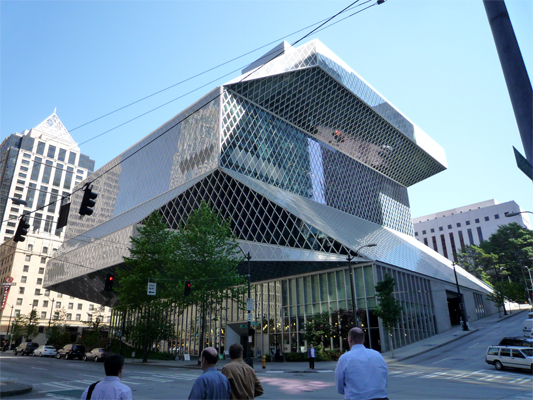 Downtown, you will probably walk by the Seattle Public Library, designed by Rem Koolhaas. My mother was quite involved in this and it has won a number of international design awards. The predecessor to this library is where I learned to love books – and I like this one even better. 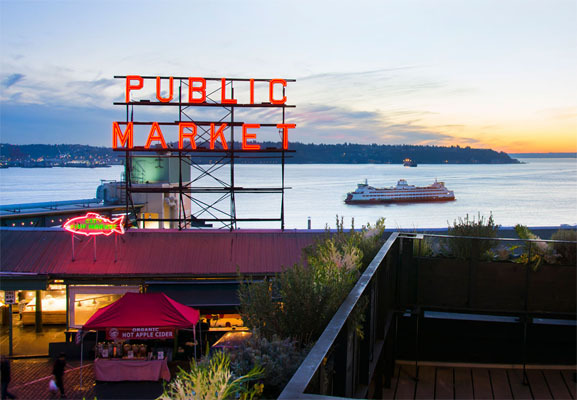 Venturing toward Puget Sound to the downtown waterfront, you can go to the Pike Place Market. This can get crowded and touristy, but it has iconic fishmongers throwing salmon like rugby balls, Dungeness crab and all manner of arts and crafts. You might take an UBER to the Market and then wander from there. There is a French grocery and cooking shop nearby. It’s within easy walking distance from the Ferry Terminal and the Seattle Great Wheel, as well as shopping, the Seattle Art Museum and the Seattle Public Library. The Museum of Flight at BOEING Field is about 20 minutes south of downtown. Boeing also allows guests to see its planes being made at its factory about 40 minutes north of Seattle. The Tacoma Art Museum expanded last year (with a gift from friends of ours) and has an outstanding collection of paintings and sculpture of the American West. An hour south of Seattle. The Foster White Gallery, located in Pioneer Square, is a premier gallery of the West Coast. The gallery permanently shows works by Kenneth Callahan, Alden Mason, Mark Tobey, and George Tsutakawa. You can take a sea plane from Lake Union (15 minutes from your hotel). Either go up for an hour of sightseeing, or Kenmore Air can take you to Port Townsend on the Olympic Peninsula for lunch. They will fly you to picnics, kayaking and biking adventures in the San Juan Islands. You can take a Washington State Ferry from the Seattle waterfront over to Bainbridge Island and have a wander and lunch in Winslow – the island town a ten-minute walk from the ferry dock. It will get you out onto Puget Sound. There are seven wineries on the island if you have time to taste. There are a number of award winning wineries within an hour of downtown and you could do a tour. They are in pretty country across Lake Washington. Here is a link to the Four Season’s guide to the wineries. You can rent Kayaks and/or paddle boards and go among the houseboats in Lake Union (think ‘Sleepless In Seattle’) or to the Arboretum. The University of Washington rental canoes for $10/hour to visitors. Get out into Elliot Bay (Puget Sound) for an hour and half on a sailboat with Sailing Seattle. There is a wonderful Japanese garden in the Arboretum. Out at the entrance to the Woodland Park Zoo, there is a rose garden which has flourished in the perfect Seattle climate since 1924. Green Lake is a perfect size for biking, walking. It is near the zoo. The Hiram Chittenden Locks provide endless action and pleasure and working boats join salmon (the salmon climb ladders to return to the rivers of their birth to spawn) as they make the transit from Puget Sound to Lake Union and Lake Washington. Want to sit outside for minute? Seattle has 26 Privately Owned Public Open Spaces (POPO’s) which have been set aside by developers and offer access to the public. Do you want to also reference the article you wrote for ASE on POPO’s? ASE article describing POPO’s. Renee Bassetti has a shop in the Fairmont Olympic. Great bespoke shirts. They are expensive and addictive. They are worn by Melinda Gates and Oprah. See ASE article. Renee’s daughter, Sarah Alexandra, has just begun a ‘ready to wear’ version of these high end shirts. Mario’s is a luxury clothing store owned by Mitchell’s in Greenwich. Think Loro Piana. Filson Flagship Store Since 1897 Filson has made “Unfailing Goods” like plaid shirts and durable hunting, working, and outdoor clothes. Their handsome, roughhewn flagship store now features upscale outdoor clothes plus duffels, bags, canvas and leather gear, watches etc. All the clothes are made on the premises and you can watch the skilled seamstresses. It is just south of the Mariners stadium. 1741 1st Avenue South. Seattle has an interesting contemporary art gallery scene. There is a gallery walk from 6 to 8 on the first Thursday of each month. If you are there at another time, use this gallery list to target your ramble around Pioneer Square. The Elliot Bay Bookstore is a gem. If you haven’t read The Boys in the Boat, this is your moment. Amazon, having put other bookstores out of business, has built its own, brick and mortar bookstore in University Village. About 25 minutes from your hotel. Good Dim Sum across the street. Want confirmation that you are on the West Coast? Check out the ‘man kilts’ at Utilikilts. Yes, this is for real. Washington State has stunning natural beauty including three National Parks: Olympic, Mount Rainier and North Cascades. My husband and I love to go to Mt. Rainier to hike, to Hurricane Ridge to picnic and to Whidbey Island to ramble – but they are all a couple of hours out of town. I can recommend favorite walks from Seward Park to Snoqualmie Pass, but I think those are for a longer visit – and another article. Not enough ideas? Check out this site for a different “view” point. Seattle South Side. We have not used this site, but it does have some different options than we’ve discussed. Thank you, Molly! Great additions.